You can add an "unsubscribe" link to your sequences, to enable your recipients to opt out of future sequences you send. If a recipient unsubscribes, they'll only be unsubscribed from your sequences and you will still be able to send them individual emails. Unsubscribe links can be set up for an individual account, or by role within an organization. You can also download a CSV of your Unsubscribed list by clicking Download CSV, as shown on the screenshot above. This file will include all recipients who have unsubscribed from your sequences up until the date you download the CSV. You can see and manage your Unsubscribed list in the Contacts area of your dashboard. Add contacts to the Unsubscribed list by entering their name or email address under Add a contact to this group. Remove a contact from the Unsubscribe list by hovering over the contact and clicking the trash can next to their name. If your Unsubscribe settings are managed by your organization, the Unsubscribed list shows all the recipients who have unsubscribed from the sequence emails of anyone in your organization. 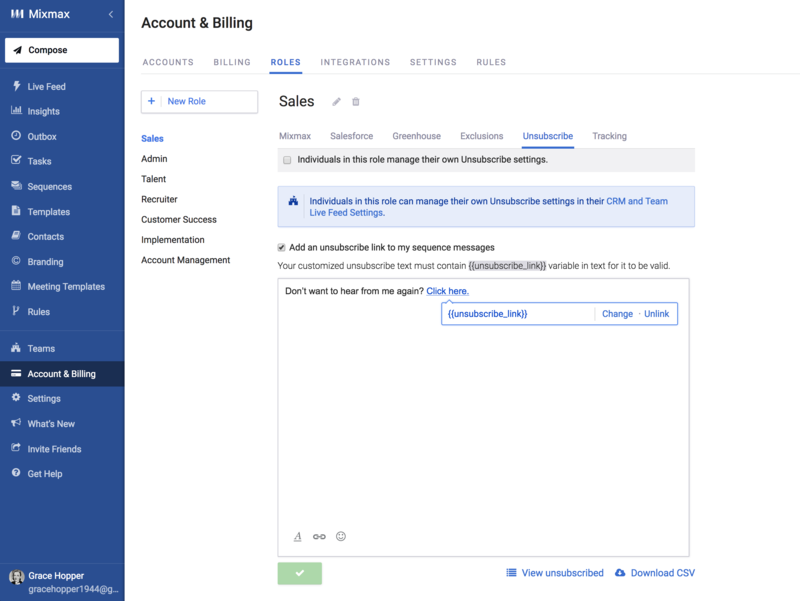 If your Unsubscribe settings are managed by your organization, then once a contact is in your Unsubscribed list, you and anyone else in your organization will not be able to add them to a sequence. If an Unsubscribed recipient is added to a sequence, they'll be automatically removed and you'll see a notification indicating that a recipient was removed. 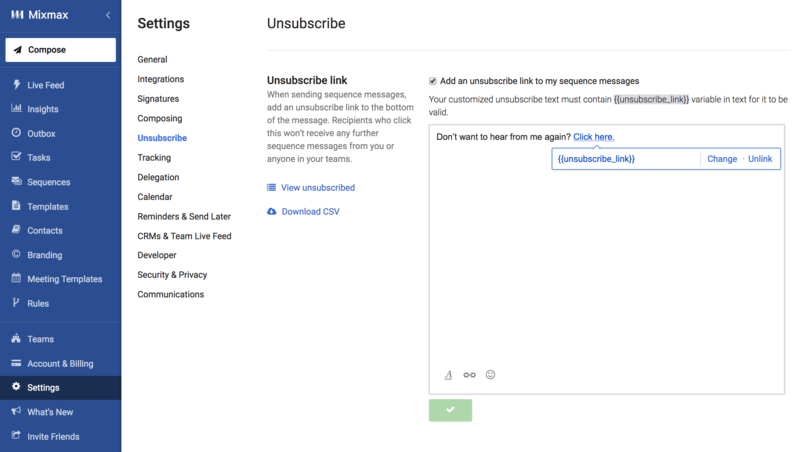 You can also set up Rules to take action when your recipients unsubscribe or resubscribe to your sequences. The unsubscribe/resubscribe triggers can be found in the Tracked Link section when creating your Rule. Why add an unsubscribe link? The laws and policies regarding the use of unsubscribe links in "cold" outreach vary by country. For example, in the United States, cold emailing and the use of unsubscribe links is regulated by the CAN-SPAM act of 2003. Other countries, such as Canada and the European Union, have stricter rules. We recommend looking over these rules before emailing prospects, and including the opt out link in all outgoing messages you send via sequences.